Many relevant articles in the Pula Imvula covering various aspects of soybean production and correct techniques to ensure good nodulation have been published by this and other authors since 2012. It is a good idea to look at some of the back issues as a rich source of information. This article will examine some of the critical aspects of production to increase yield and look at nitrogen use by the plant. The period before the planning and planting of the soybean crop can be used to assess in detail what happened last year on your farm. Some farms suffered a very bad drought and yields from 0,3 t/ha to 0,5 t/ha if the farmer was lucky. One can then refer to the average yields from years prior to the 2016/2017 production year to benchmark yields on your deep and medium potential soils from the various cultivars used. Many farmers will probably not include soybeans in their planned crop rotations due to past disappointments and the excellent performance of late planted sunflowers in one of the most difficult production years ever. Where do you stand? The world average soybean yield has increased by 60% over 30 years since 1980 from 1,6 t/ha to 2,6 t/ha. Yields of 7,8 t/ha have been realised in Japan and the USA. Our national average was 1,56 t/ha in 2015 and 1,49 t/ha despite the drought this season. There some excellent cultivars available in South Africa suited to the various microclimates, height above sea level soil, summer and seasonal heat units prevailing on your farm. By now you should have identified a minimum of three cultivars that work in your area and on your farm. Dry land production yields over 2 tons and more are quite possible with the cultivars available if your land preparation and good crop husbandry practices are used optimally. The final seed yield components of soybean plants are a function of multiplying number of seeds per area and seed mass or weight. Seed number per area is calculated by the number of pods and the average number per pod. The number of pods is decided by the number of flowers and the seedpod formation rate. The number of flowers depends on the number of nods on a stem, the number of stems per plant and the planting density or number of emerged and growing plants per square meter or per hectare. What can the farmer control? Although the above factors might seem simplistic or logical it is extremely important to study each of these every planting season in each cultivar you use to enable you to increase yields over time. The farmer can control planting density. Previous articles covered the general rule of thumb that 250 000 plants/ha is a good compromise for water utilisation and seed yield. Planting density is one of the most factors for soybean growth and seed yield. A final plant stand of between 220 000 and 250 000 would be acceptable for striking the target of over 2 t/ha. Remember that when planting density is too high the branching potential of each plant is depressed and the number of lateral stems decrease. Under a too high planting density the competition for photosynthesis and nutrient absorption amongst plants becomes severe and plants will tend to grow tall and thin. These plants are also prone to lodging at pre-harvest and harvest time. 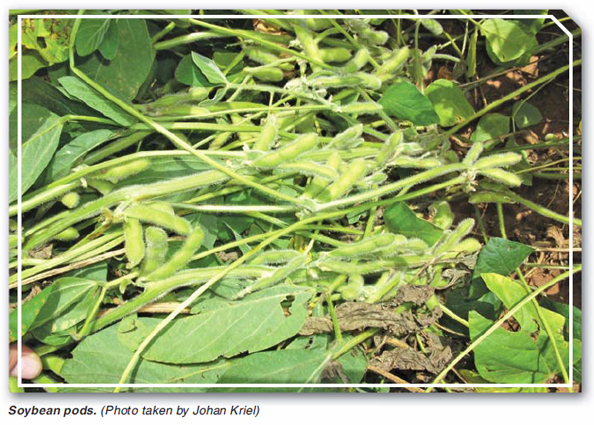 Your yield will depend mainly on the number of pods per hectare. Generally over 50% of soybean flowers will abort before the day length is optimum for seed set to take place. Seed mass is mostly affected by growing conditions in the late growth stages. As is continuously advised do soil tests and follow fertiliser recommendations or proved applications of nutrients. Soybean plants respond best to high inherit soil fertility built up over several seasons with different crop rotations. It is essential that the lands be ripped or loosened to alleviate any soil compaction present from cattle running on the previous crop residues or tractor and implement traffic. Soybeans required well aerated soils with a loose profile to enhance nitrogen production by the rhizobia and allow for any excess rainfall to drain through the soil profile. From 25% to 75% of the nitrogen in mature plants is sourced and fixed from the symbiotic relationship of Bradyrhizobia japonicum and the soybean plant. This means that 75% to 25% of the nitrogen needed must come from the soil. Single cell nitrogen fixing organisms supply some of this within the soil matrix. The rest is held in the soil together with the humus, organic matter and other soil structures. 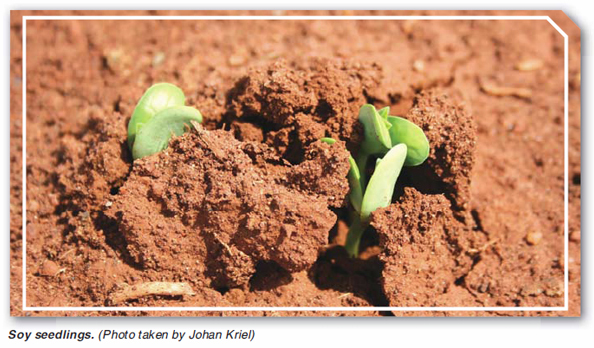 If up to 15 kg/ha is used at planting together with the recommended amounts of phosphates and potassium and placed two inches below and to the side of inoculated seed nitrogen can be available to the plant within 10 days from germination. Nodules take up to 21 days to start supplying the plant with N. Low soil fertility cannot be corrected at the time of planting. Take some time to study and know the important seed production factors and plan to plant on fertile loose soil to achieve your target of 2 t/ha yield in the coming season.